I saw it last night and loved it. The sequence where the machine finally worked had me leaping about in my seat like a child. I kind of remembered why I took up engineering in the first place. 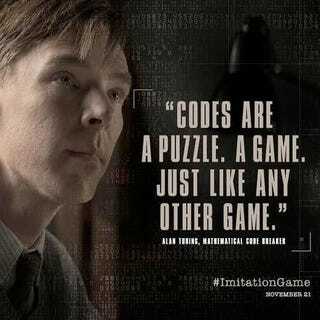 I'd be interested to hear others' opinions about the way the movie tackles the subject of Turing's sexuality. I'm a little conflicted about their decision not to show Turing's relationships with men, beyond the unreciprocated schoolboy crush. Note: I've had a couple of cans, so this may not be the most coherent review of the movie available.